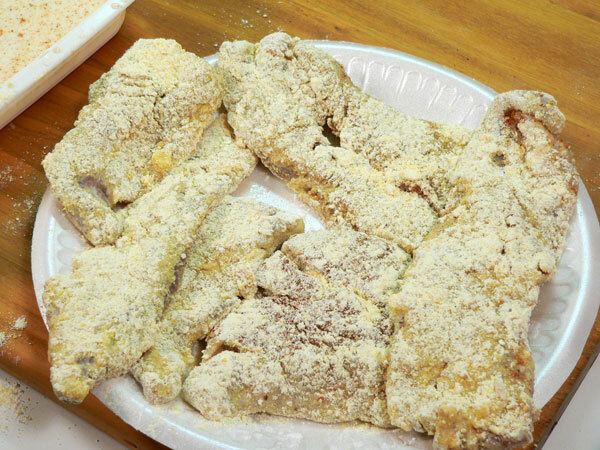 Follow our step-by-step, photo illustrated instructions for this Pan Fried Bluefish Recipe. 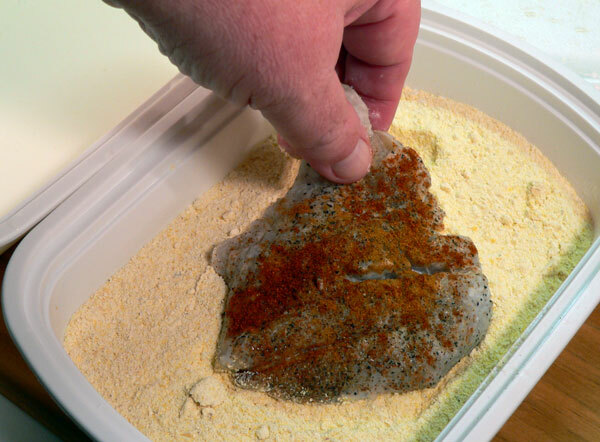 These saltwater fish are absolutely delicious and easy to pan fry in your cast iron skillet. Just add a simple breading, pan fry and enjoy. To the best of my knowledge, I enjoyed Pan Fried Bluefish for the very FIRST time… just a few days ago. My niece had invited her dad (my brother) and I for supper a couple of nights ago and fried up a big old pan of Bluefish that her husband had recently caught. I was totally surprised at how great these fish were and wondered why in the world I had never had them before. That night, we dined on Bluefish, homemade coleslaw and super thin cornbread cakes. Talk about some good eating….I loved it. The interesting part though is that my niece doesn’t like fish or any type of seafood. Wait, it gets better. Just a few years ago, she owned and operated a restaurant that served BBQ, Chicken AND Seafood. Go figure. She just doesn’t like the taste of it but she sure did know how to cook it. You can skip on down a bit for the step-by-step instructions and the printable recipe but, I’d like to share just a few photos about a recent trip that my brother and I made together. I’ll try to be brief but if you know me at all, that usually doesn’t happen. Anyway…. All was well until about 30 minutes away from the delivery destination. We called and found out the place we were delivering to had closed early that day. Seems the following Monday was a holiday and they wouldn’t be open again until Tuesday. Older brother said he hated to haul the cookers back home, about a 3 hour ride, so he said we’d ride down to his beach house at Oak Island and spend the night. He’s had this house at the beach for 10 years and due to our work schedules, I had never even been to his place at the beach. OK, that’s another long story. So, we headed further south and arrived at his place about dark that Friday evening. 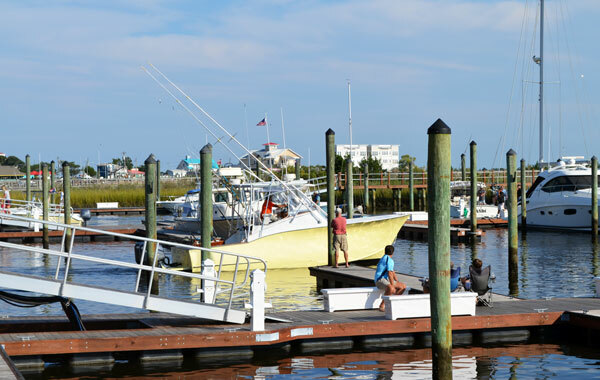 The next day, we drove over to Southport, which is nearby and, visited the area where the 2012 US Open King Mackerel Fishing Tournament was taking place. 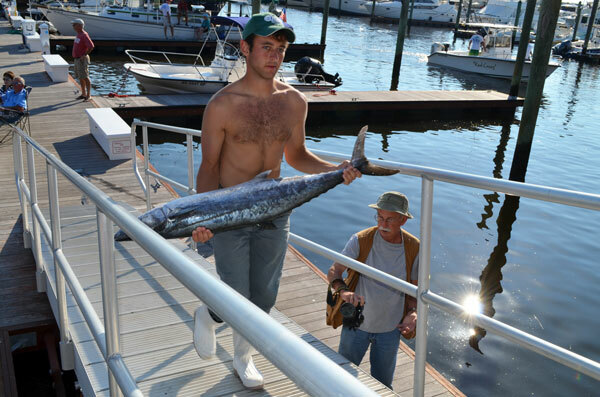 The tournament had over 400 boats fishing for King Mackerel. There was a large crowd of folks down at the boat docks watching the boats bring in their catch. It was a pretty impressive site if you enjoy fishing any at all. Boats were coming in just about the time we arrived and we watched as they hauled in some very large King Mackerel that day. I have no idea who these people are but this guy has a fish I wished that I had caught. It wasn’t the winning fish however, which turned out to be about 47lbs. 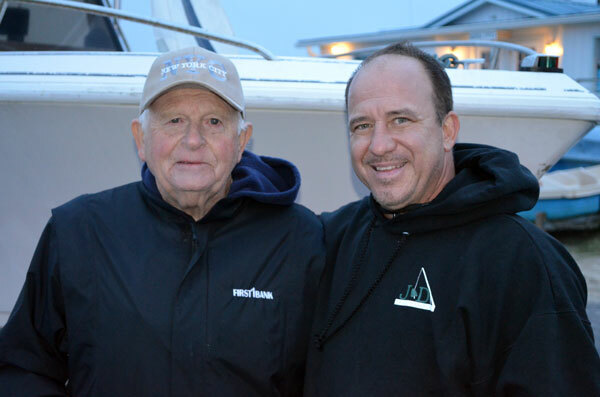 Biggest fish caught paid a Grand Prize of $25,000.00. Not bad for a few hours work on such a beautiful day. The weather was just perfect that day by the way. Lots of sunshine and about 72 degrees…..what more could you ask for. We spent an hour or so walking around and watching the fish being officially weighed in. Several large tents were setup to facilitate the weigh in and a stage was setup for some music later in the evening. 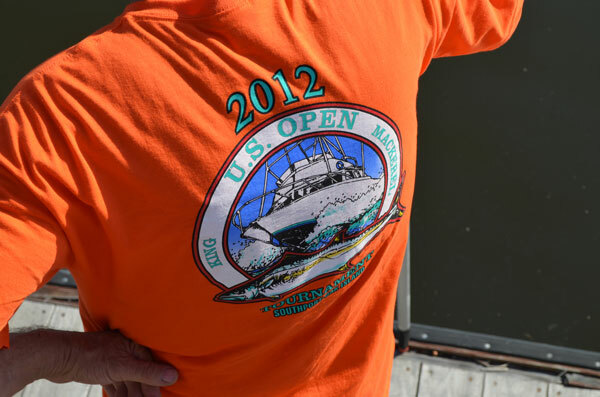 For us though….it was time to go fishing. We went over to one of the piers at Oak Island and fished for a couple of hours. We had hoped we might get into some “spots” but it wasn’t going to happen that day. We ended up only catching a few really small Croakers and some Pinfish, nothing big enough to keep but, we had a good time just talking with other folks that were fishing all up and down the pier. We left around 5pm, went out to supper where we enjoyed some great seafood and then pretty much headed back out on the pier for several more hours of late night fishing. Again, we just weren’t catching anything big enough to keep. The beautiful breeze and just sitting out on that pier made it all worthwhile though….no denying that fact. This is my brothers boat. He’s had it for five years and I had never been out on it. There’s a good reason for that though….I’m just not a boat type of person. I have become a pretty avid fisherman over the past years and have spent many hours up at Harris Lake fishing off their pier. That’s freshwater fishing and I love fishing for Crappie. They’re fun to catch and super delicious to fry up as well. So, on Sunday, my brother convinced me to go out on his boat. My biggest fear has always been just getting in and out of the boat. My old legs aren’t what they use to be and I can’t swim. It’s just never sounded like a good thing to get into a boat. We took the boat down to a public boat ramp area and hanging on to anything I could find, I managed to settle down into the boat. We rode over to Southport once again and then took a ride back on a waterway area near where his beach house is. I didn’t have my camera with me and I missed some pictures of some totally gorgeous million dollar homes along the way. I don’t fish on Sundays. It’s a personal preference and I don’t fault anyone that does. My daddy never did and I decided once I started that I wouldn’t either. We enjoyed the ride that afternoon and pulled the boat out of water right about dark. Then, we headed back over to the same Seafood House for more fried fish and shrimp. That’s my one and only older brother on the left. The fellow on the right is a friend of his that refers to my brother as one of his mentors. He joined us at the beach house on Monday and took us both out for lunch. We had a delicious home-cooking style of meal for lunch and then we headed back out onto the water. 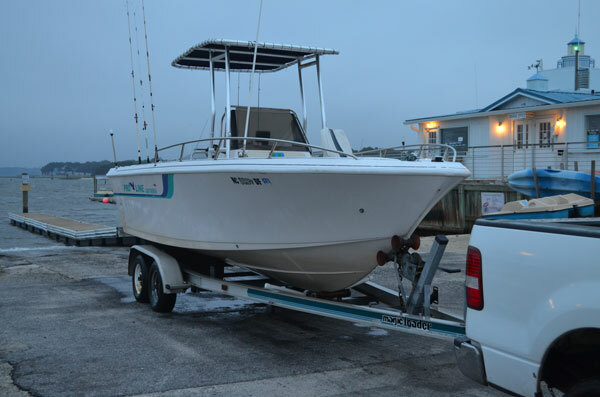 We went to another marina this time to unload the boat. The temperatures had dropped a good bit by this time as cooler weather had moved into the area. We rode out into the ocean itself for about half a mile but then turned around and headed back for the waterway to do some fishing. That pleased me a BUNCH. I haven’t got into my story of having been afflicted with motion sickness all of my life. It’s true, that’s another reason that I’m just not a boat type of person. The waterway was much smoother though. I hate to rub it in but, I caught more fish than both of them combined that afternoon. (Wait…are they reading this?) Problem was, it was still some very small Croakers and Pinfish and none of us ever caught anything big enough to keep. So, what’s that got to do with THIS recipe. Nothing….nothing at all…other than its about fish and fishing and being able to spend some time with my older brother and making a new friend. We ended up staying 4 nights at his house…..something we had NEVER done before. I guess not being able to deliver those pig cookers turned out very well in the long run. We did get to drop them off on the following Tuesday and headed back home. I just hope and pray we can do it again sometime soon. 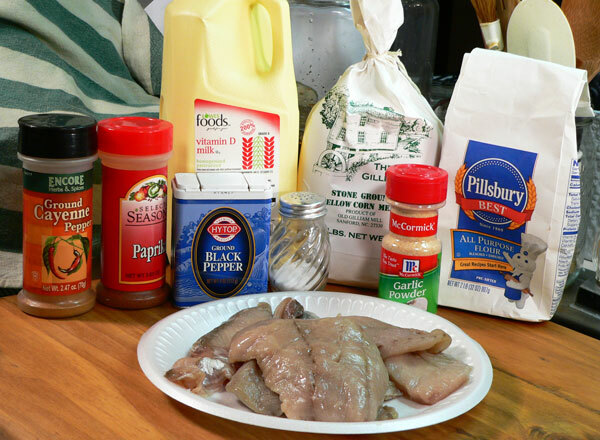 Pan Fried Bluefish Recipe: You’ll need these ingredients. Please note though, this will pretty much work with any kind of fish that you might want to use. It’s a basic recipe and can easily be converted or adapted to other fish. Don’t let the color of those fillets fool you. This is one more good fish in my book. You might hear a different opinion on that somewhere else though. Some folks think the Bluefish has a very “fishy” taste but I didn’t think that was the case. I’ve also been told that you have to drain the blood from these fish right after you catch them so they avoid having a foul taste to them. As it turned out, my niece and her husband headed off to the Outer Banks of North Carolina the day after we got back home. That’s how I ended up with this Bluefish. HE caught them. I’m glad he did and I’m really glad that they both shared some with me. I enjoyed my meal at their house that afternoon and when I left, they handed me two big packages of fish to bring home. So, if you’re all set to give them a try….Let’s Get Cooking. The first thing I do is setup my dredging station. The fish have been rinsed and cleaned and they are ready for breading. As pictured above, I have the fish on a plate in the upper left corner. Then, I have a container with plain flour, one with milk and one with cornmeal. I also have another plate to place them on once they have been dipped into the flour. To be honest, I rearranged it a bit after I took this photo. In case you don’t recognize them, those are plastic containers from where I’ve been eating Chinese Takeout. One of my readers left the comment on another post that her husband referred to them as “Chinese Tupperware.” I liked it. They are just too useful to toss in the garbage so I’ve been growing a collection of them in one of the cabinets. First thing is to grab one of the fillets and place it in the flour. I’m using plain flour because I had it on hand. I doubt it would make any difference if you used self-rising….it’s just a matter of what you have on hand. Coat the fillet in the flour, flipping it over and making sure you have both sides well covered. 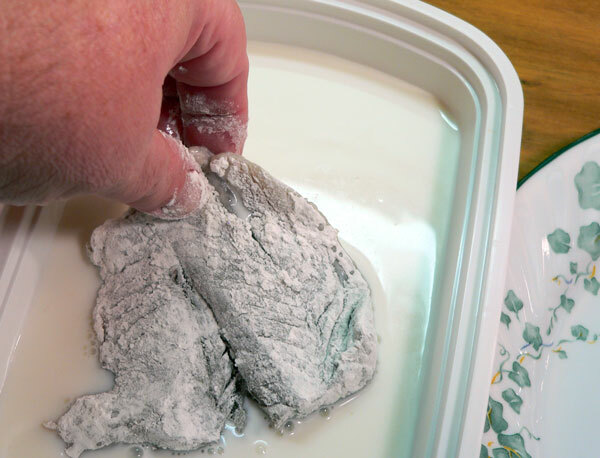 Next, dip the flour coated fillet into the milk. This is just regular whole milk from the jug. Back in my restaurant days, we always used the Evaporated Milk from the can for dipping all of our seafood before frying. I think because it’s a bit thicker that it helps hold the breading on the fish better but again, just use whatever you have on hand. Flip the fillet and be sure you get both sides good and wet. 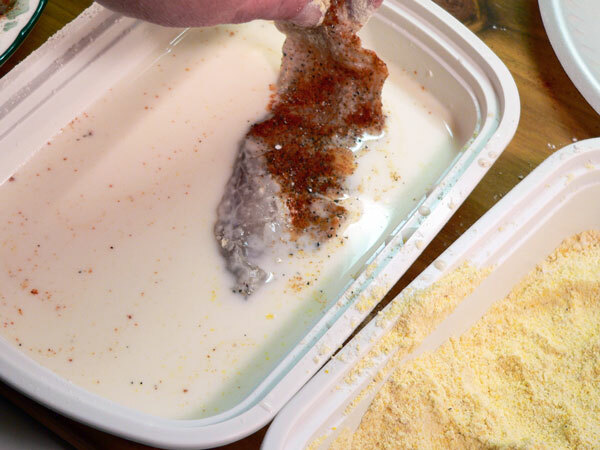 After you pull them from the milk bath, lay the fillets on a plate, keeping them separated. 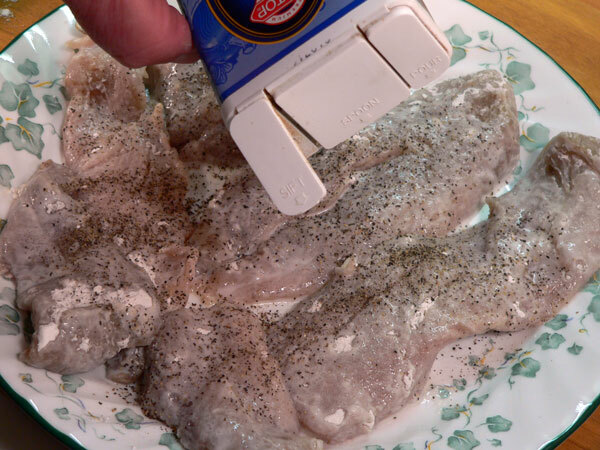 Sprinkle the fillets with salt. 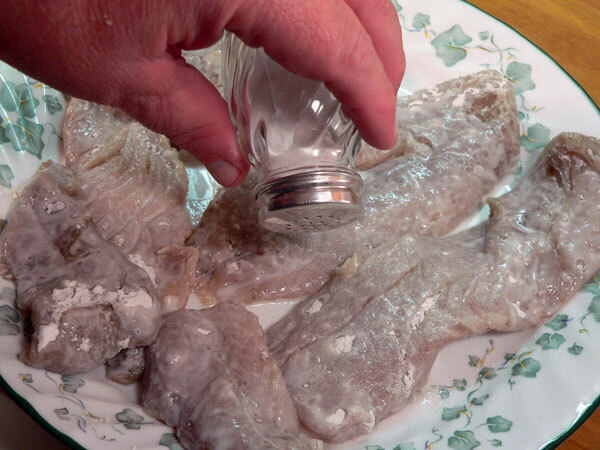 I found out the Bluefish need a good coating with salt to bring out more of the flavors. I went a little heavier with the salt on the second batch that I fried up. Seasoning up the fillets at this point is just the way I like to do it. It’s just a personal preference. You could add the seasonings to the cornmeal and do it all at one time but I prefer to season them individually this way. Do whatever works best for you. This just seems to give me better control on how much of what is actually going on each fillet. Also, I don’t think it takes as much of the seasonings when you do it this way as compared to mixing up a batch with the cornmeal breader. Spices aren’t as cheap as they once were you know. Sprinkle on some Black Pepper to taste. 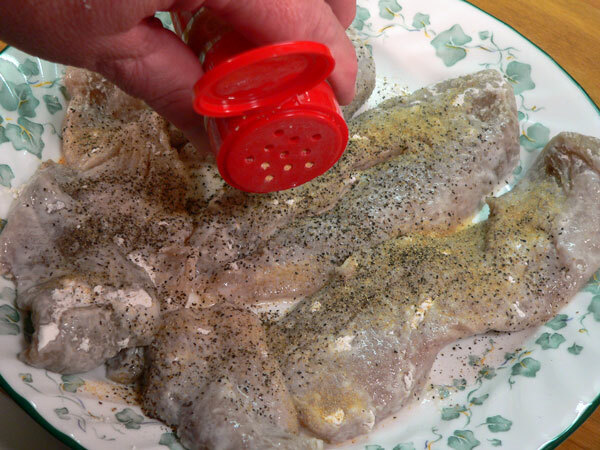 Sprinkle on some Garlic Powder. Add some Cayenne Pepper. A little spice is a good thing. 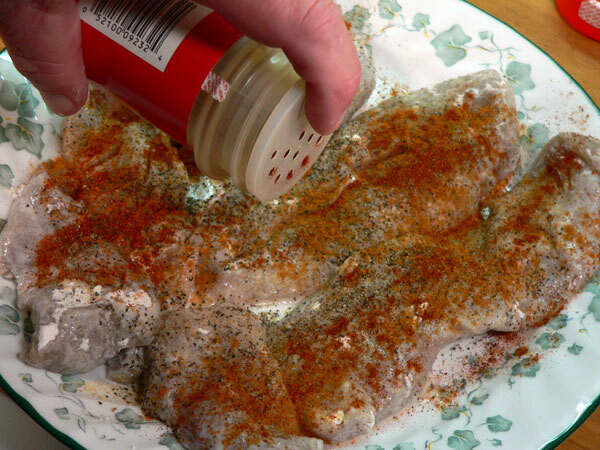 Finally, sprinkle the fillets with a generous portion of Paprika. Then, place the seasoned fillets in the cornmeal. We’re going to coat both sides with the cornmeal. Coat both sides very well, then gently shake off any excess. Excess cornmeal that’s not actually sticking to the fish will just fall off once you drop the fillet into the cooking oil. 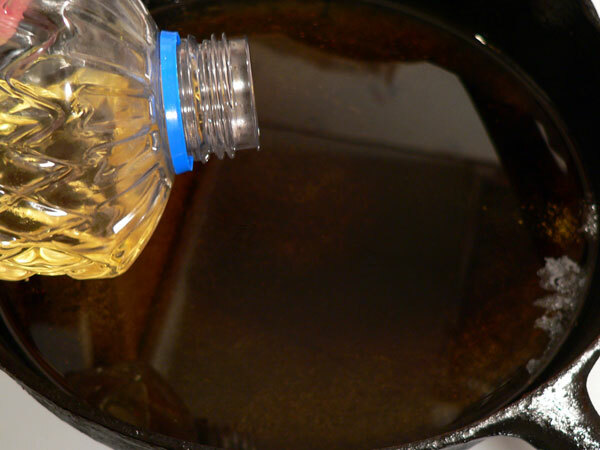 That usually sinks to the bottom and burns, making your cooking oil have an off type of taste. Avoid this happening by gently removing any excess at this point. 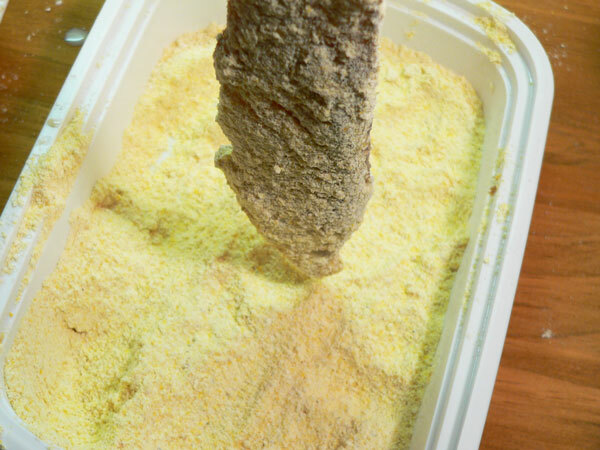 If you’re taking pictures of everything you’re doing, you might find that the fillets have dried out a bit too much to hold a decent coating of cornmeal. 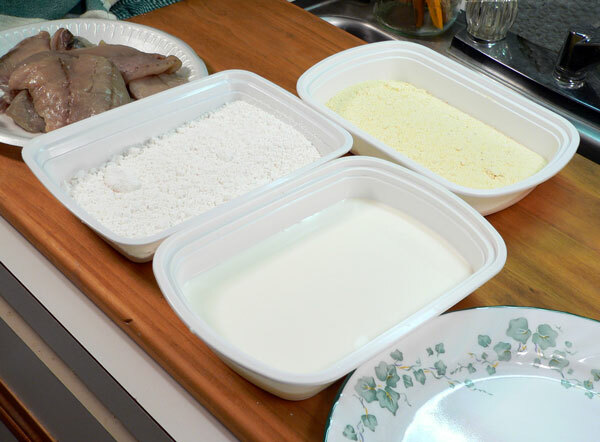 Even if you’re not taking pictures, you can re-dip the fillets in the milk once again to get them wetter. That way, they will hold a bit more of the cornmeal breading. After I dipped them in the milk the second time, they went right back into the cornmeal. Once you have several pieces coated, just sit them aside until you heat up the oil in the cast iron skillet. In keeping with the Taste of Southern way of cooking, I’m using my cast iron skillet to fry up the fillets. Any type of frying pan will work of course. 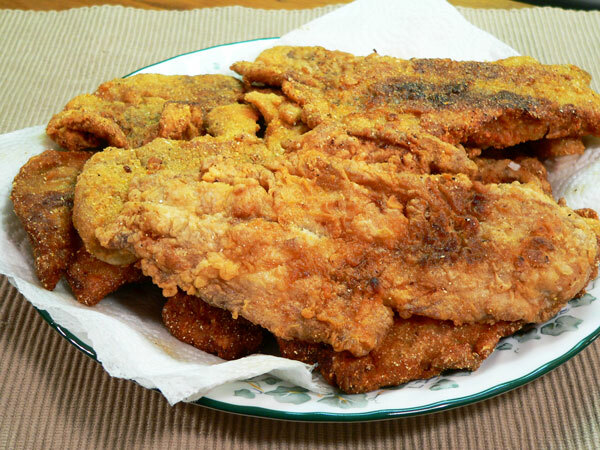 You could also use a deep fat fryer if you have one but, keep in mind we’re calling this recipe our PAN FRIED Bluefish Recipe…thus…the pan. Pour in enough oil to fill the pan to about 1/2 inch deep with oil. 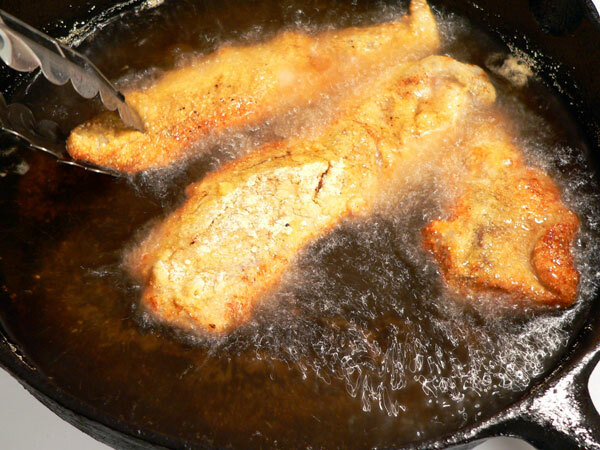 Let the oil come up to frying temperature before adding the fillets. How do you do that? 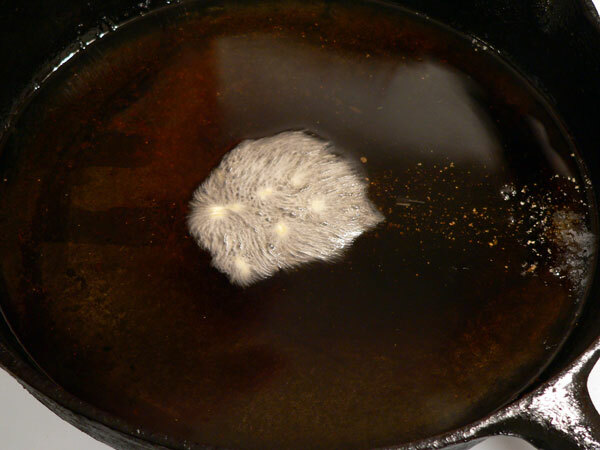 One way to test that the oil is hot enough for frying is to drop a pinch of the cornmeal into the pan once it heats up. If the cornmeal just sinks to the bottom, it’s NOT hot enough for frying. On the other hand, if the cornmeal dances across the top of the hot oil….you’re good to go. Oh yeah, thermometers work pretty good too. Just saying. That oil is HOT so be careful with this step. Carefully lower one end of a fish fillet into the hot oil. You can do this by hand if you’re cautious or you could use tongs if you have them. The oil is probably going to start popping and splattering but just let go of the fillet and let it start cooking. Don’t overcrowd the pan with fish. The pieces need some room to cook. Add a couple of pieces and let them cook for a couple of minutes. Watch for the bottom edges to start turning brown. When the bottom edges start to turn brown, gently flip the fillets over to cook the other side. I used tongs but a spatula or even a fork will work. If you use a fork, slip it under the bottom and carefully turn the fillet over, don’t puncture it with the fork. These pieces are firmed up enough to easily turn with the tongs. Let them cook for about 2 minutes longer then carefully remove them from the pan. As you take them out of the oil, place the fillets on a plate that’s been lined with several layers of paper towel so they can drain. If you need to cook some more pieces, you could turn your oven on to about 200º and just place the drained pieces on a baking sheet inside the oven. Don’t leave them on the towel if you intend to place them inside the oven. They’ll stay warm in the oven until you can fry up the rest of your batch. Serve the fish fillets while they are warm. They’ll go great with some of our homemade Cole Slaw. You’ll find our recipe for that right here on our website. You can also fry up some hush-puppies or maybe some thin cakes of cornbread if that’s more to your liking. I had originally intended to fry these up and make some Fish and Grits for breakfast. One problem with that…..I didn’t have any grits. Go figure. Watch for it though….I’m headed to the store to pick up some grits. I’ll do that recipe for you as well. Fish and grits are another great Southern meal good for breakfast, lunch or dinner….or anytime. 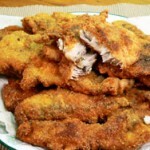 I’ll also show you a Hot Fish Sandwich so check the site for that recipe. I made a good fish sandwich out of a couple of the smaller fillets from this plate, then I cooked up a whole new batch of Bluefish. I still don’t know why I had never had this fish before now. It was a great discovery though and I hope you get a chance to try them yourself real soon. Let me know if you do. 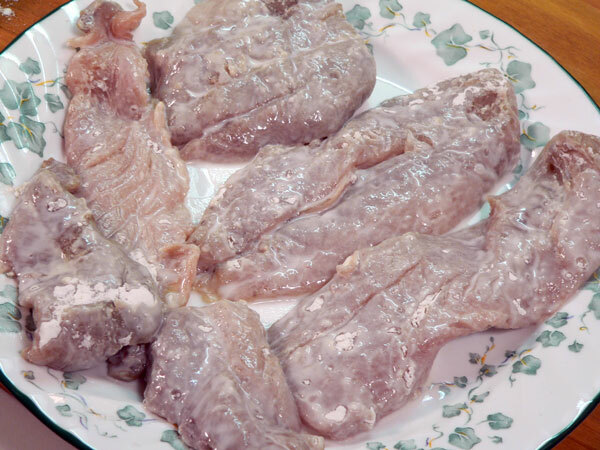 1 pound of Bluefish Fillets, or fish of your choice. Lightly rinse fish fillets and place on paper towel lined plate to drain. 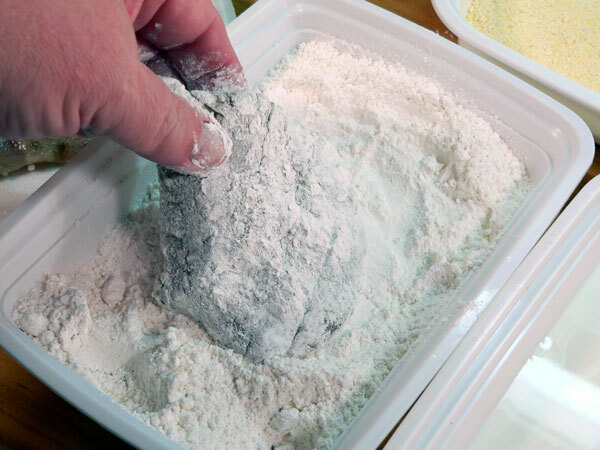 Setup your dredging station with flour, milk, cornmeal, each in separate containers. Dredge each fillet, one at a time, through the flour, coating both sides well. Dip into milk, coating both sides, place fillets side by side on a plate. 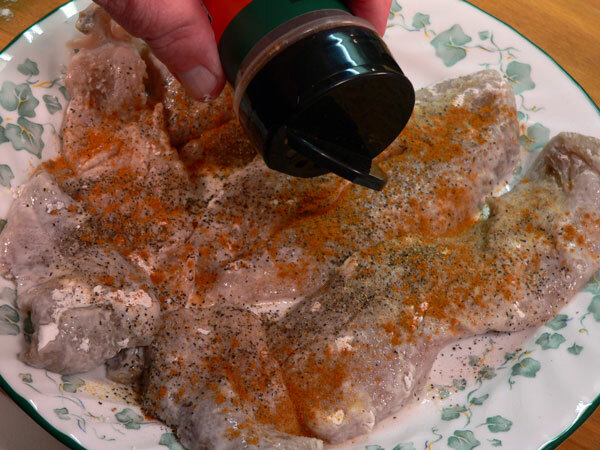 Sprinkle fillets lightly with seasonings, Salt, Black Pepper, Garlic Powder, Cayenne Pepper, Paprika. 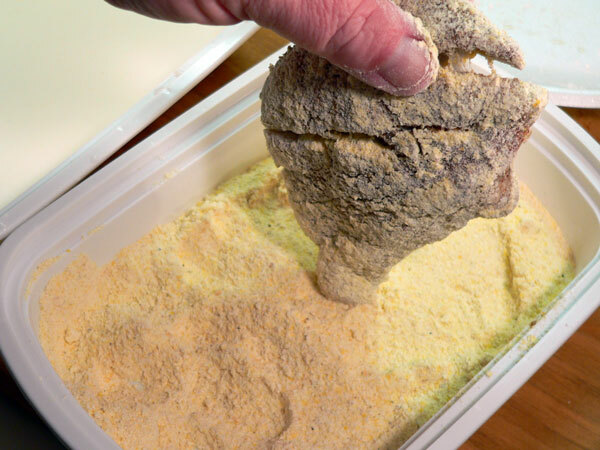 Dredge fillets, one at a time, through the cornmeal, coating both sides. Place coated fillets, side by side on a plate and let rest for about 5 minutes. Add about 1/2 inch to a skillet placed over medium to medium-high heat. 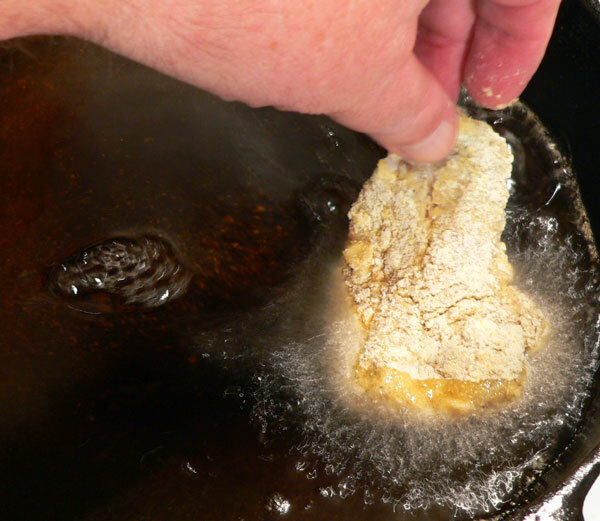 Test oil for proper frying temperature by sprinkling a pinch of cornmeal into the oil. If it sinks to the bottom, oil is not hot enough. If the cornmeal “dances” across the top, oil is ready. If using a thermometer, oil should be at about 350º or slightly higher. Carefully add fillets, one at a time, into the hot oil. It’s hot and may splatter so use caution. Add other fillets into the pan, one at a time but do not crowd the pan. They need room to cook. Cook fillets for about 2-3 minutes or until the bottom edges begin to slightly brown. Carefully turn each fillet and let cook another 1-2 minutes until done. Remove fillets from hot oil, place on a plate lined with paper towels to drain. 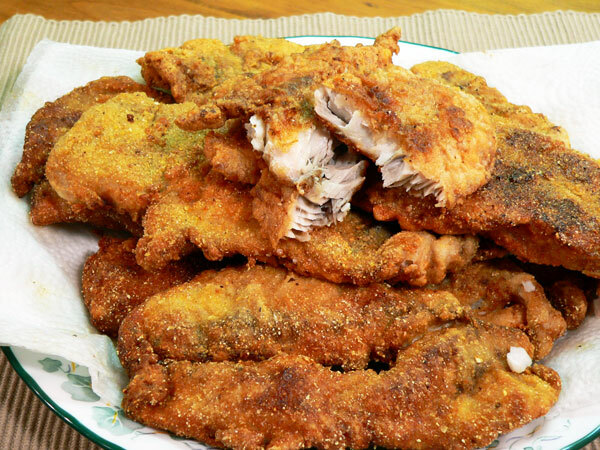 This recipe can be used for most any type of good frying fish. Season to taste according to your personal preferences. Fillets may also be fried in a deep fryer if you have one. Your Comments: Been fishing lately? 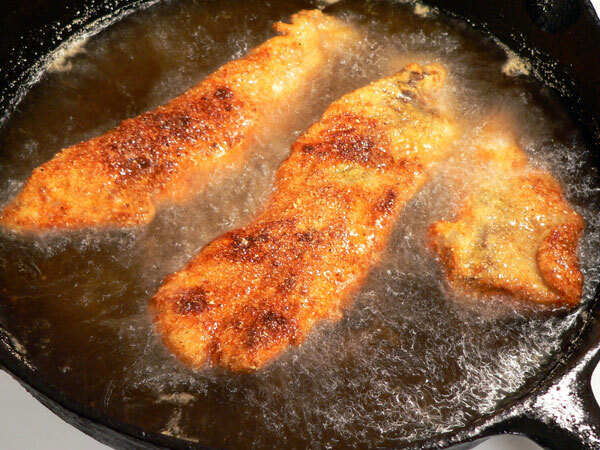 Do you deep fat fry fish or prefer to pan fry it? I’d love to hear your comments regarding our recipe for Pan Fried Bluefish. It will only take a minute or two for you to share your comments with us. And, it’s really the only way we have of knowing that you stopped by for a visit. Lots of folks view our recipes each day but we really appreciate you taking of your time to let us know that you have tried or intend to try, one of our recipes. Thank you in advance for your visit and we hope you’ll share our Taste of Southern.com website with your family and friends. Please come back and visit with us soon. We currently post a new recipe each Monday morning. This recipe was delicious! Thank you so much! I’m from Rhode Island, but have lived in Texas for the past 12 years, and you cannot know how difficult it is to find seafood here. Bluefish is one of my favorites and was readily available in RI, but not so much in Texas. I’ve saved your recipe so that I can try it when I finally get my hands on some. Thanks. I want to give this recipe a try but first I had a question about thawing it. I hear bluefish gets a fishy taste once its frozen and then thawed. Is there anything I can do to do prevent or get rid of the fishy smell/taste? Hi Jim, You might try soaking the fish in some milk for an hour or so before frying it. You also might want to cut away any dark meat if it’s left in the fish. Blues, have a blood strip that runs down the side and the fish needs to be cut when caught so the blood can drain out. It’s a little messy but a needed step I’m told. PS: If this doesn’t work, we’ll blame it on my nephew that caught and gave me the fish in the first place. How’s that? Excellent blue fish recipe. I have never fried fish before. Our family caught 20 blue fish out of Hatteras. I googled frying blue fish and found your step by step recipe. Easy to follow and more importantly, great tasting fish!